This past week, I spent a couple of days out in Indiana visiting my miller, grain broker, and the elevator that sold me the grain. Mock me if you will, coastal snobs, but there is nothing like the midwest countryside in June. It’s humble and breathtaking at the same time, and they’ve got some especially pretty country up there in Northeast Indiana. Next stop: Mitchel Enterprises, of Bluffton IN. Leon arranged the purchase of the wheat. He gently corrected me when I called him a broker – in the business, a broker is a middleman who does not touch the actual stuff. Leon is more appropriately known as a “jobber,” a different breed of middleman (another term none of these folks like, but what seems to be a necessary element in this business) that buys and sells the actual grain and by-products of grain. This, in commodity speak, is known as the “cash” market, although if I had to carry around enough actual cash to pay for all this stuff I would have needed a briefcase (there have been multiple instances of sticker shock on this trip, first at the Rinkels’ and then at Leon’s). Leon and his nephew Jan buy, sell and transport grain and grain by-products – they deal a lot with waste products that accumulate during the industrial food production process. Often these can be used as feed or bedding for animals (here’s where I am torn between a distaste for industrial meat production and a respect for resourcefulness). And finally, at the end of a very long, hot day in the car, I made it to the elevator where the wheat I bought came from: Lehman Feed Mill in Berne, Indiana. Jeff Lehman, the owner, looked no less hot and worn out than I did but still took a break from his running about to talk to me about their business, and let me wander around in the 90 degree heat as long as I liked (which was not very long) to take pictures (seen here). He and Leon both do some hedging on the Board of Trade, especially to cover large transactions, but preferred to stay in the cash market whenever possible. Jeff told me that trading has been more volatile overnight the last few years, so he will often place trades before the close of business or on Fridays, especially during the harvest when he’s shelling out a lot of cash as farmers bring in their crops. Jeff says he tries get farmers to focus on quality rather than yields, but that can be tough. The higher quality grain is kept separate so that it can go to customers like me, who will pay a premium for it. Occasionally, a larger elevator will buy Lehman’s high quality grain to blend, so that their lower quality grain will meet a deliverable standard (be prepared to read more, much more about grain quality in upcoming posts). To sum up: Three family businesses, two very large checks, and two straight days of talking, taking pictures and asking questions. All of which were expected, but then there were also some surprise adventures that happened on this field trip. During a dip in a local lake I was entertained by the arrival of three buggyloads of beer-drinking, hip hop listening Amish teenagers obviously on rumspringa. Way tanner and in better shape than the other group of redneck “English” teens at the lake, they entered the bathroom in traditional garb, and came out looking like California surfers. The next day, before heading back to Chicago I stopped at a diner for dinner. As I ate, the buzz began about a big storm heading out our way. By the time I’d finished, all the other customers had run out to hole up in their basements. The restaurant staff and I gathered about the Weather Channel and gawked; the restaurant owner closed down the kitchen early and sent most everyone home and I waited out the storm with the owner, a waitress, a busboy and three cups of coffee. Folks were calling with weather updates, at least two of which included tornado sightings. We were on the edge of our seats – did you know the cooler is the safest place to be in case of a tornado hitting a restaurant? “It’s kind of a research project.” (at this point, any mention of art seemed unnecessary information). And with that, the cop turned around and went back to his car with my drivers’ license. After about 10 minutes of me literally and figuratively sweating it out he came back with his partner. Partner (female): “Can I look in your backseat?” To which I consented: “It’s 50 pound bags of wheat. Do you want me to open them up?” They poked and prodded at them for a few seconds, and then the (male) cop says in an authoritative tone “It’s wheat.” I get a mercifully short lecture, no ticket, and am told to be careful getting home. I took the train out here, and in all the hectic preparations for leaving town I forgot that it goes straight through wheat country – Montana and North Dakota. Rob and I have always taken this trip in the wintertime where it is grey and white and brown. It’s beautiful in its starkness, but it was so exciting to see green trees and fields this time. Better yet, I’m making this trip at least two more times – probably three – over the rest of the summer and fall, so I’ll get to see everything grow and change. I grew up in corn / soy fields, so all of it will be new to me. Judging from the extent of the growth and how far north it was, what I saw was likely dark northern spring wheat (AKA hard red spring wheat), which is sown in the spring. It could have also been durum wheat (used for pasta) which has a similar growing season (see maps here and here). See pictures from the trip here. I’m no RobZ, but am happy to be able to share them. “I used to ride the “L” from Logan Square to La Salle and Jackson…that was the Grain exchange stop. At that time I was only getting 3 1/2 hrs sleep, what with working, going to DeVry, and other un-mentionable stuff. I would fall asleep standing up on the “L.” There was not usually a problem of falling during the rapid stops between Logan Square and my stop. The train cars were packed pretty tight in the morning and there was always somebody to land on. Back in December, I met Mike Wolf, a talented artist and thoughtful person who has done a lot of perambulating and mulling over global institutions and big systems. Being a bit of a perambulator myself, we hatched up a plan to go for a walk around the financial district and check out the new home of the Chicago Mercantile Exchange (otherwise known as the old home of the Chicago Board of Trade). Looking down the LaSalle St. canyon, Chicago flags flap in the wind on a bitterly cold day. 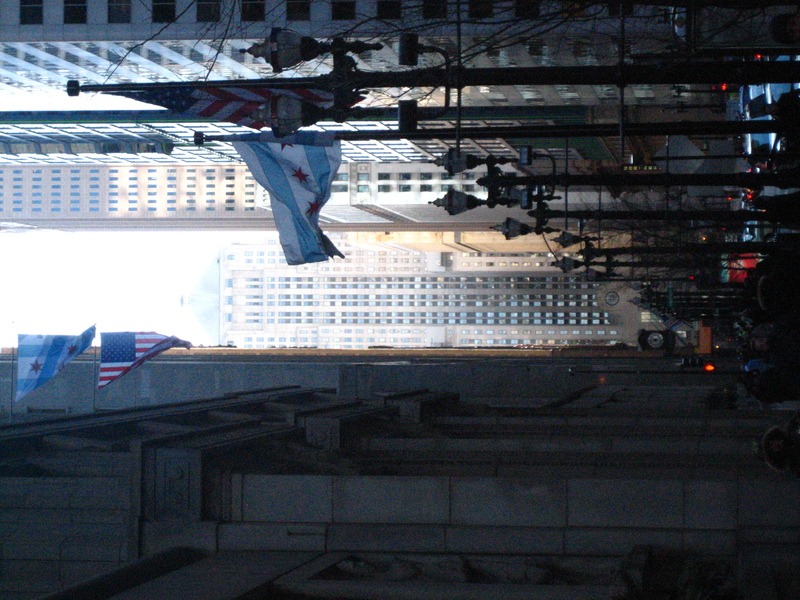 The CBOT is at end of the 'canyon,' fading into the sky in this photo. 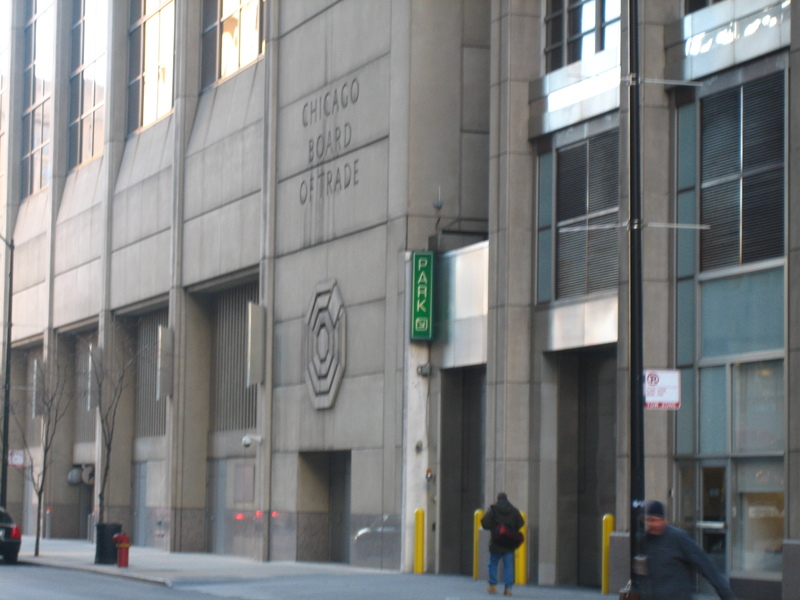 For those of you who don’t follow commodities or futures markets, up until 2007 there were TWO commodities and futures exchanges in Chicago: the Chicago Board of Trade (the CBOT, est. 1848), which traded grains, gold and ethanol, and the Chicago Mercantile Exchange (the Merc, est. 1898), which traded butter, pork bellies, and lumber. The CBOT and the Merc merged in 2007 and are now known as the CME Group. It’s pretty confusing trying to decide what to call them now – no one seems to use the term ‘CME Group’, some call it the CME and other folks still call it the Board of Trade, depending on what is being traded of course. With the merger, the CME moved into the CBOT building; trading pits, already going out of style, were consolidated and there was apparently quite a bit of controversy around whose hand signals would be the new standard in the pits. Yep, each exchange had its own unique signals! Pity the poor trader that screws that one up. Mike speculated that the names of two of Chicago’s sports teams – the Bulls and the Bears – might be connected to the city’s financial markets. I would guess the Bulls actually probably refers to the stockyards, but if Mike’s not right, he should be. Although Wall Street gets all the attention, there’s a huge amount of $$$ and power rolling through Chicago’s financial district, at the heart of which is the Mercantile Exchange. I mean the Board of Trade. Er, no, the CME Group. In 2008, the CME Group acquired the New York Mercantile Exchange (NYMEX), and this year bought up 90% of the Dow Jones indexes, including the ubiquitous Dow Jones Industrial Average. That’s quite a portfolio. Here’s – to the degree that I’ve been able to reconstruct it – the CBOT building history. If there are any people out there that know these dates / locations definitively, by all means tell me if these need to be corrected…I found some conflicting – or not quite clear – information. 1848: First site at 105 S. Water St.
1860: Moved to temporary location on S. Water St.
1865: Moved to LaSalle & Washington (Chamber of Commerce Building); this building was destroyed by the Chicago fire of 1871. After the fire, the CBOT moved to the Wigwam at Washington & Market. The Wigwam was a gigantic convention center built to house the Republication national convention that nominated Lincoln for president. Once the Chamber of Commerce Building was re-built, the CBOT moved there until 1885, when it opened its own building, a large brick Victorian style designed by William Boyington, in the current location at LaSalle & Jackson. The building was the tallest in Chicago for a time. 1930: The first LaSalle & Jackson building was replaced with the current art deco building. It’s a beauty (although I heard somewhere that Frank Lloyd Wright poo-poohed it when it first was built) and was recently renovated back to its art deco grandeur. Unfortunately, since 9/11 access into most of the building and to the trading floors are limited – Mike and I had to stick to the lobbies, the main hallways and the lower level restaurant Ceres. It looks like if you go with the Chicago Architecure Foundation on a lunchtime tour you can take a peek at the trading floor. We also walked around the outside of the building, noting the ornamental touches: grain motifs everywhere, the famous faceless sculpture of Ceres, goddess of grain at the top, and the gorgeous portraits to either side of the clock by Alvin Meyer – a Native American Indian woman to the left holding corn, and an Egyptian holding wheat. 1980: A major addition was tacked onto the existing building. 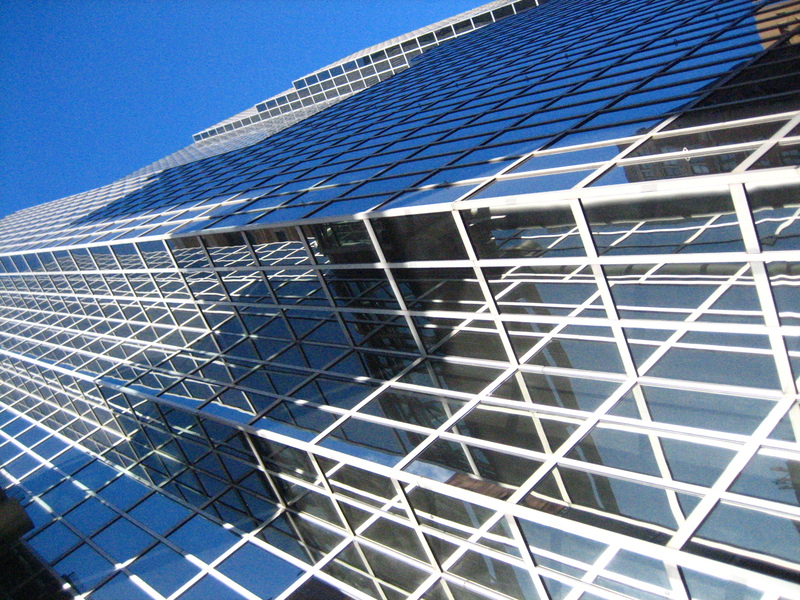 I have to say, Helmut Jahn’s postmodern rectangular steel and glass box clinging to the back of the tall and stately existing building was impressive, but lacked the grace of the original building and certainly has a tough time relating to it architecturally. Still, it’s not as bad as the dull boxlike Chicago Board Options Exchange (CBOE) building lurking just behind it. 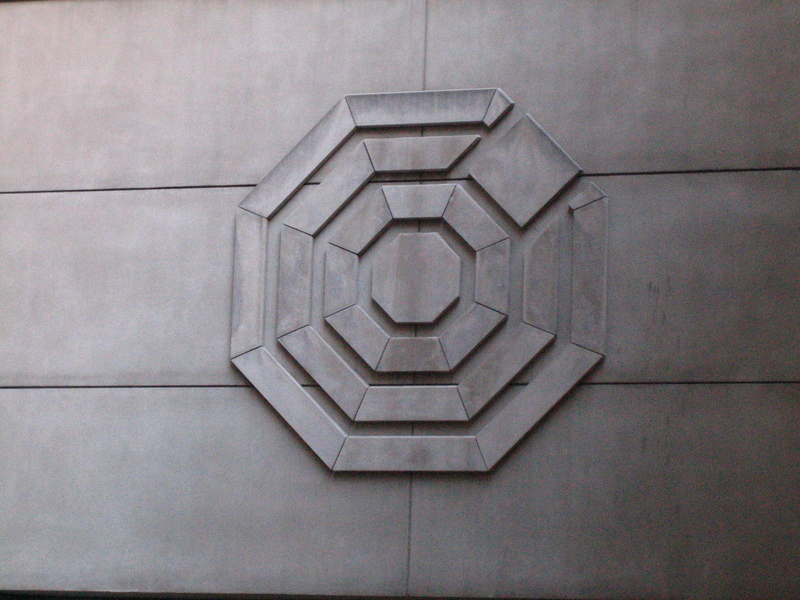 A close-up of the CBOT (CME Group) logo. I have some exciting news to share: an anonymous donor has offered to match all kickstarter donations made to the project in the next ten days, up to $500. If you’ve been planning to make a donation (or maybe even if you haven’t), it will now go twice as far, so go here to donate. For those of you in Seattle who are going to be coming out to the going away party / fundraiser at our place on Friday, June 11 – if you donate to kickstarter between now & then, you will be rewarded with a night of free party drinks! Not that my undying gratitude isn’t enough, but Rob (my mate) is making his very special homemade absinthe (actually infused vodka, we don’t have a still out back…yet…) and we are planning some delicious absinthe cocktails. Thanks to the very special, generous matching donor, all those past & future donors, and to all of you spreading the word!